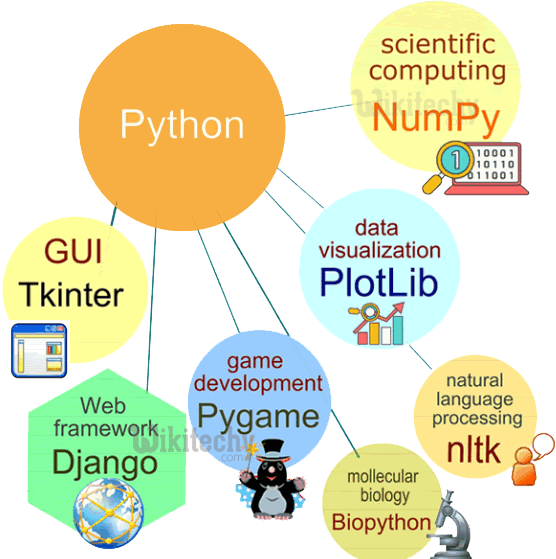 In this article you will get to know what is python used for or its applications. Python is an ubiquitous scripting language. Of course many of us might be aware of the magical things we can do with the help of python, that is another story all the way and we will talk about this sometimes later for sure. These days python has found its way to web development, app development, scientific and numeric field, business applications, GUI designing, automation, artificial intelligence, machine learning and what not. So without investing much of our time let’s dive further and see what python has to offer to the world. We will go step by step further into this and try our best not to miss any point, but unfortunately if we do please let us know in the comment section as there are immense possibilities pertaining to python. Let us quickly start our journey with python and see some of the applications of python. Though sometimes referred as a supporting language, the python can be used for the development of rigid software as a whole. This might be surprising to some people but true, that in this era, python is being widely used in professional software development at much larger scale. Companies like Google itself are using python programming language in the development and testing of it’s product. A lot of services being provided by google are deployed with the systems written in python and to surprise the YouTube’s homepage is too written in python (isn’t this cool?). Okay let us quickly now see some of the major softwares that we come across in our daily lives which are written in python. Google: The google is among one of the prominent companies which uses python in its development and design. Python is proven to be efficiently handling the traffic deployed on google and its connected apps and is very well known for computing purposes. YouTube: One of the most beloved apps these days which is very much in trend for leisure times is of course YouTube and to surprise is written in python. Dropbox: Starting from storing documents at first, Dropbox has spread its wings now to store literally everything and the functionality of sharing and synchronising the stuffs saved has made it even more lovable to its audience and all this is powered by python. Instagram: Instagram has become the most trending application for the purpose of sharing pictures and videos for its people. Apart from sharing, several other features are being provided by this application which is all powered by python and make it even more popular. Quora: The next big giant after google which is proved good in providing solutions to all the queries posted in a most realistic way is none other than Quora. And all this thing is summed up to an application with the help of python. Apart from the applications we have discussed above there exist lot more softwares that are powered by python. Some of them to name are Reddit, Spotify, Bitbucket, SurveyMonkey and Pinterest.